Amazing to me how quickly the days are passing .. especially since January just didn’t seem to want to move ahead very quickly. I think that it just seems that time is moving too fast .. when I think about the lovely longer days with more things to do especially outside. Take Friday, for instance. The day was a long one and it started out in a rainy fashion. Our boot camp group met at the designated location for the Friday session. Brrrrr .. it was grey skies, a light rain and off we went. I am glad I went but really I was sorely tempted to stay home. 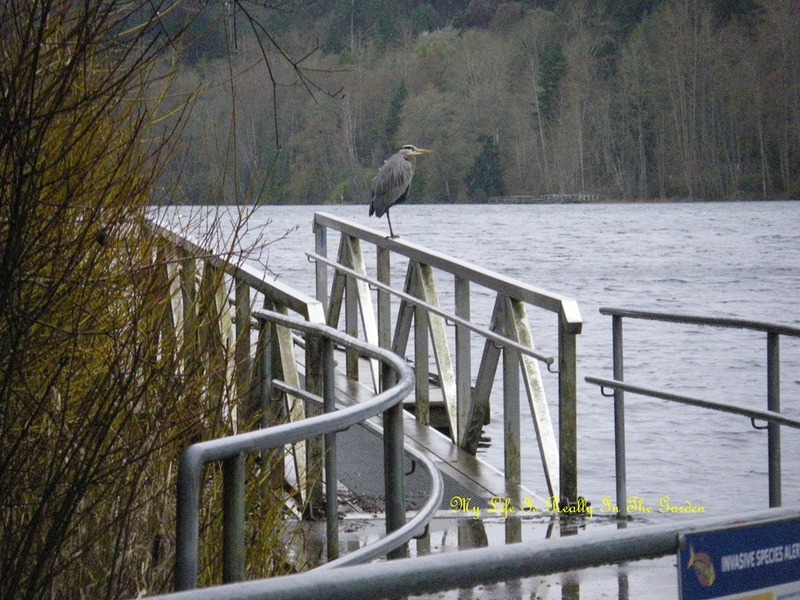 And if I had stayed home .. then I would have missed seeing this Great Blue Heron looking for breakfast! 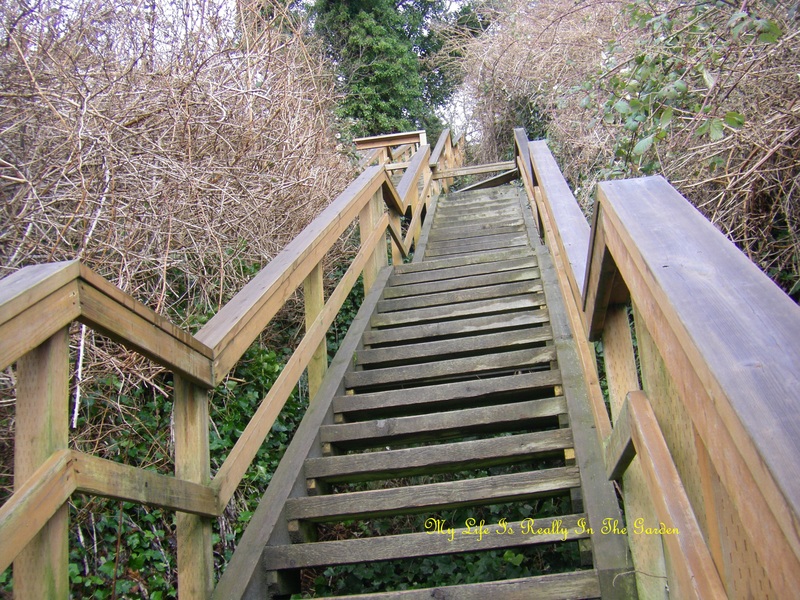 And as we went along the pathway, I turned and snapped another photo, so very glad I had decided to get out and get going. 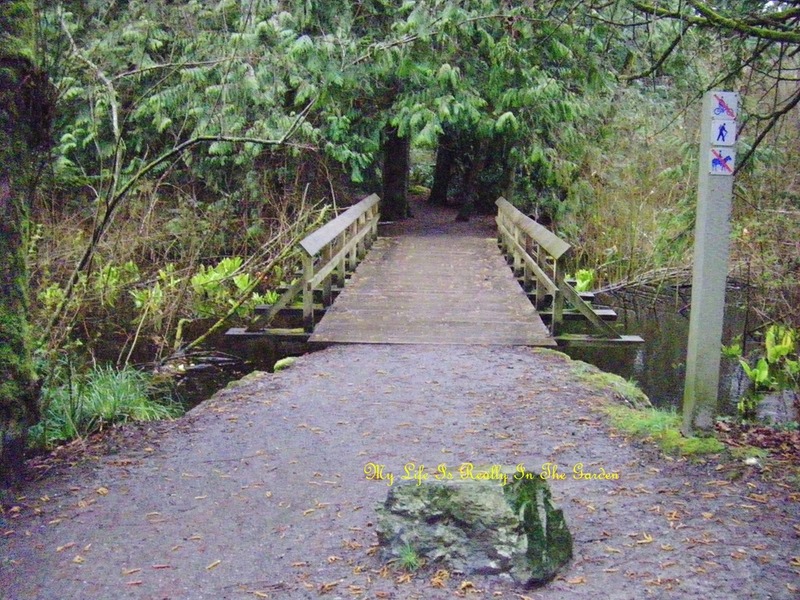 Another one of those lovely bridges/footpaths .. leading us into another area of the forest. I have recently been salvaging native plants (I belong to an official salvaging group) and had collected a good supply of Sanicula, which boasts the most beautiful yellow flowers. Glad to see this plant growing naturally, to be left alone. 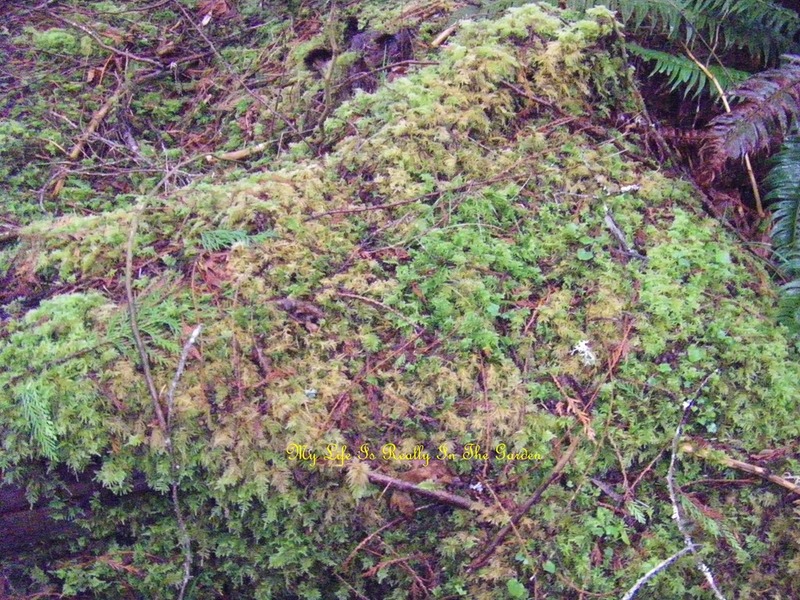 Also lots of luxurious moss … with many tiny wildflowers waiting their turn to grow. 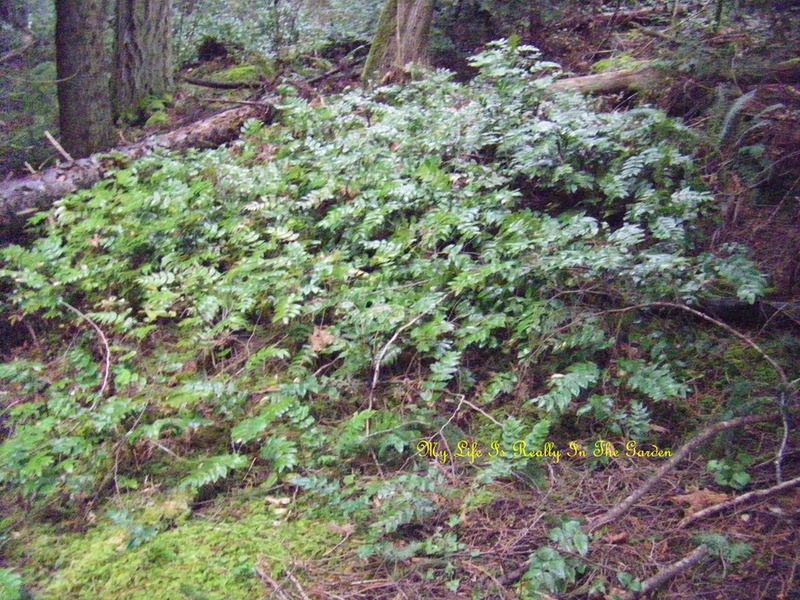 A great grouping of Low Oregon Grape .. this is what I will plant at our next home .. mass plantings! 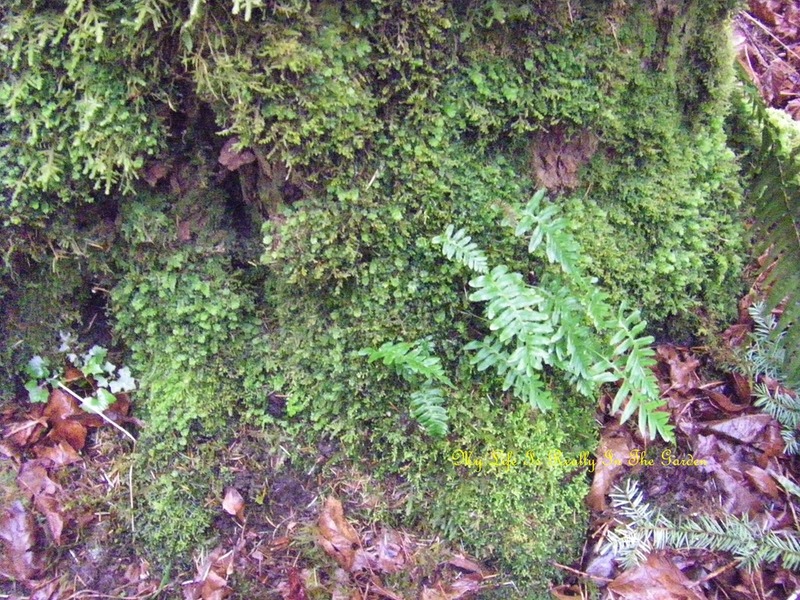 Dainty little ferns growing at the base of a moss-covered tree trunk. After traipsing uphill through muddy sections and slightly steep (for a Friday morning!) walk .. we arrived at a viewpoint. 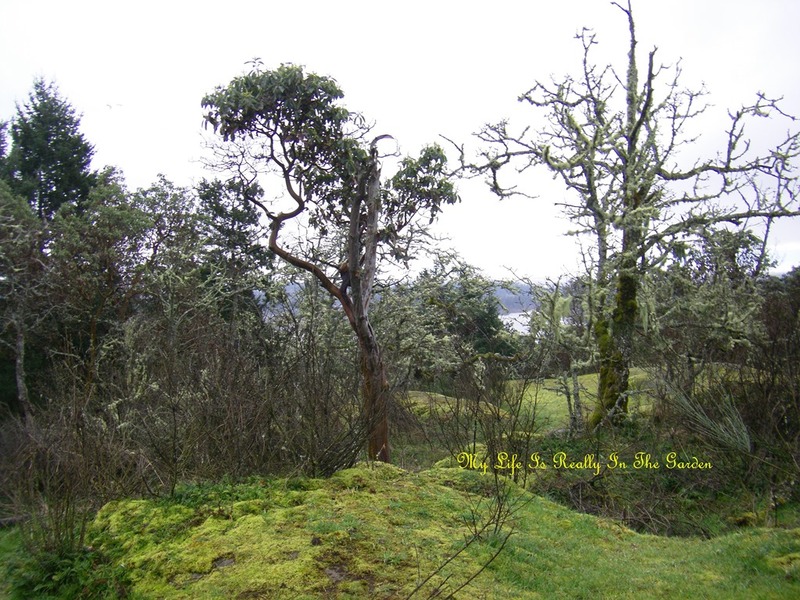 Lots of lichen on the trees .. a very tranquil spot. 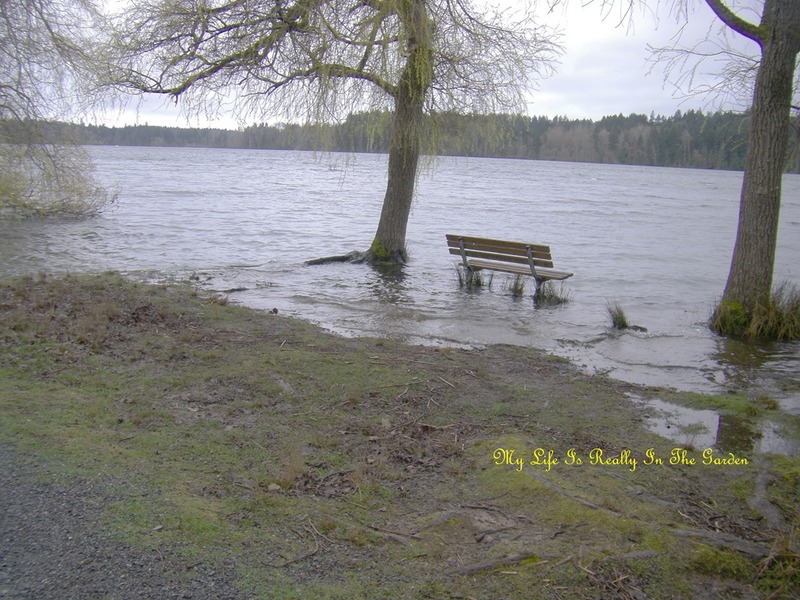 And on our return trip .. we noticed how high the water was at Elk Lake. 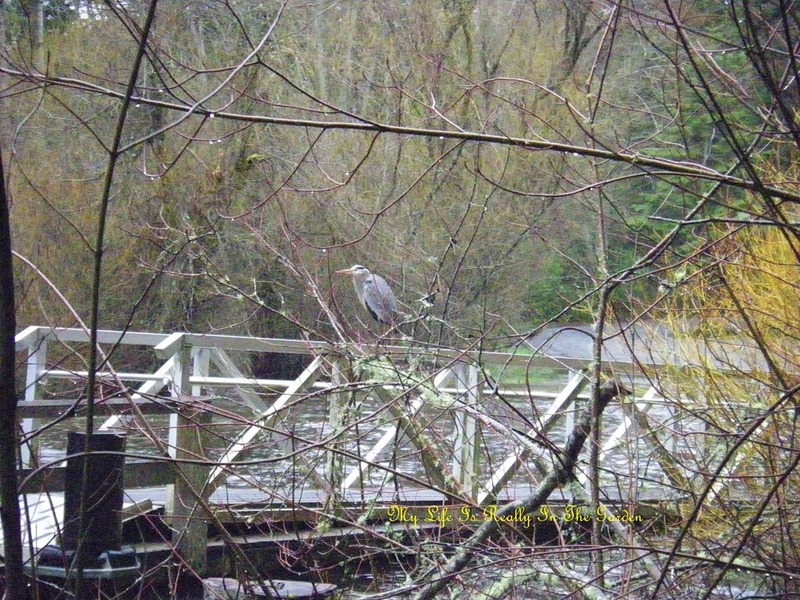 Usually there were Mallards at this area .. but they must have relocated till the waters recede a little. Oh, and here is another most wonderful reward for going outside! What a very stately and handsome guy! D said hello to him and he patiently stayed in place for that. After a minute though, he had to race to catch up to his doggy-dad. Enough time spent here … thank you very much. 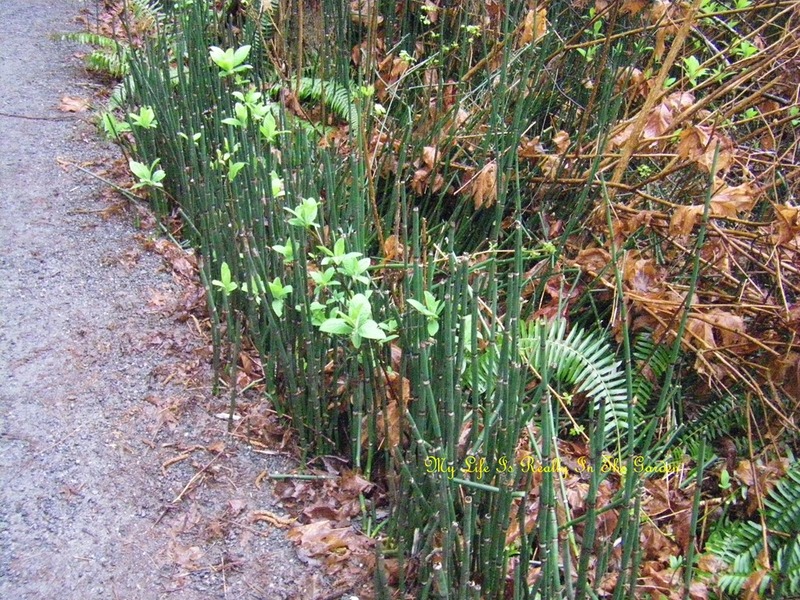 Pretty shades of green … the pale green of the Indian Plum intermixed with the deeper shade of the Horsetail … again, Nature’s Beauty is best. 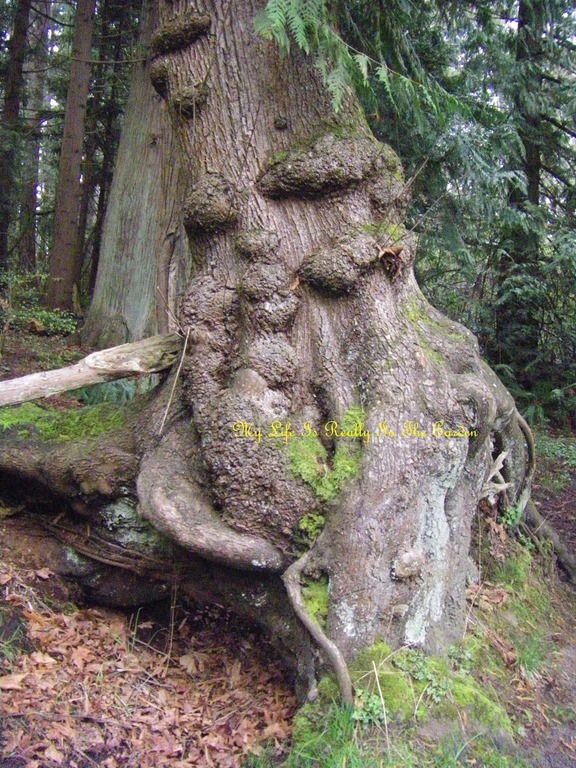 Can you see the laughing face in the tree? and also the drooping mustache? Quite a handsome tree. 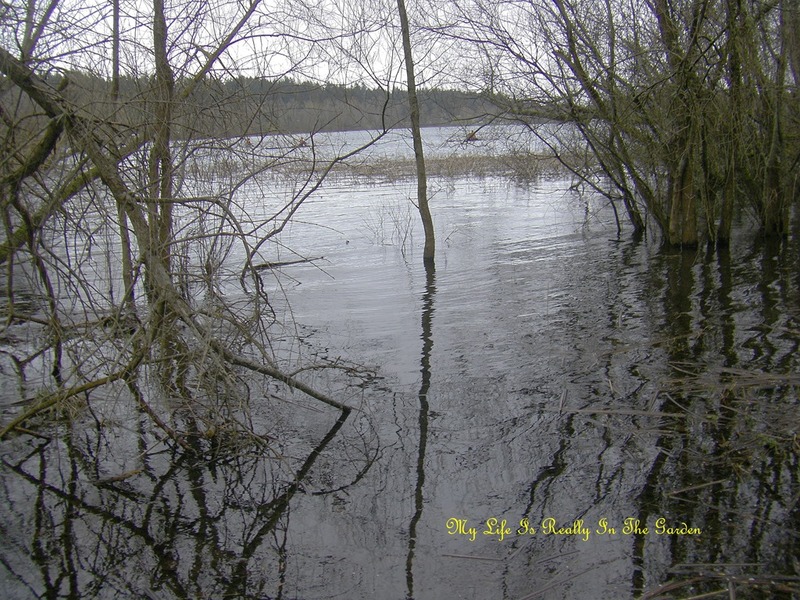 The contrast of the light/dark/shiny/dull image of the lake/trees/background struck a most appealing sight. That was the early part of my day … I then went to do some volunteering at Fort Rodd Hill .. and will share some of those photos tomorrow. 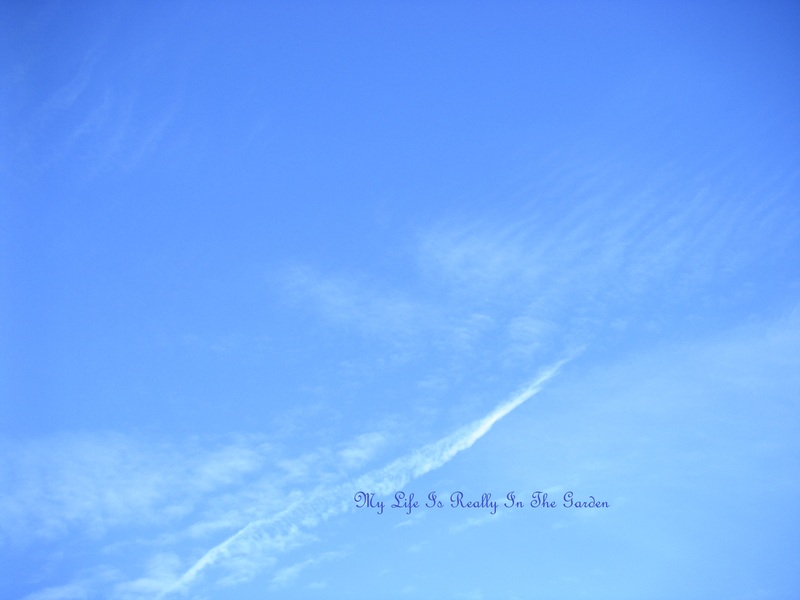 Although Friday wasn’t really a sunny day … I am pretending that the afternoon was like this .. what’s the harm, eh? 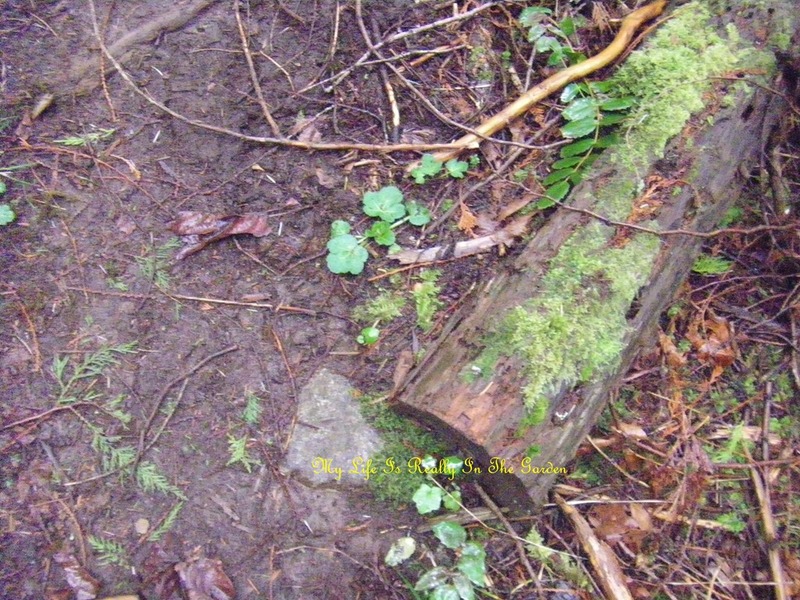 Categories: Gardening | Tags: blue skies, dogs, ferns, great blue heron, low Oregon Grape, Moss, native plants, rain, sanicula | Permalink. Today the weather was sunny and a bit of overcast ..but last Sunday, there was snow! 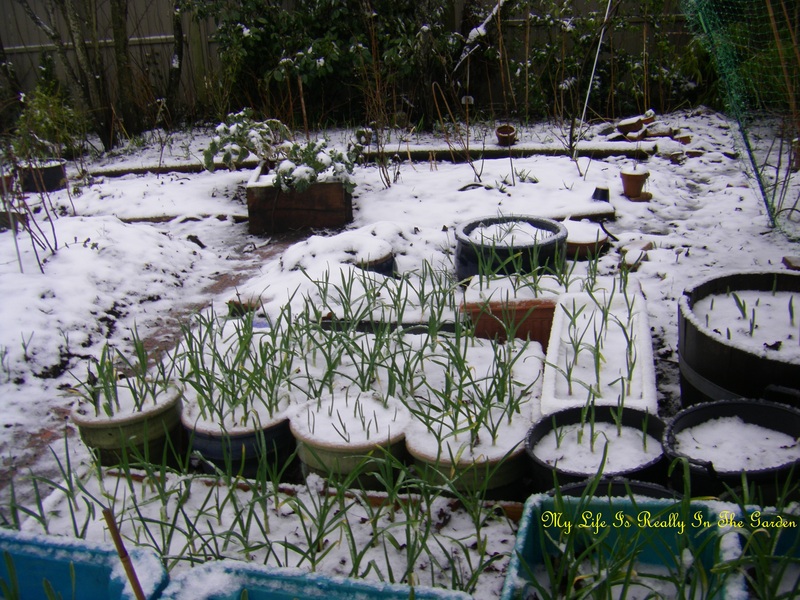 My garlic is all covered … but it is very resilient. 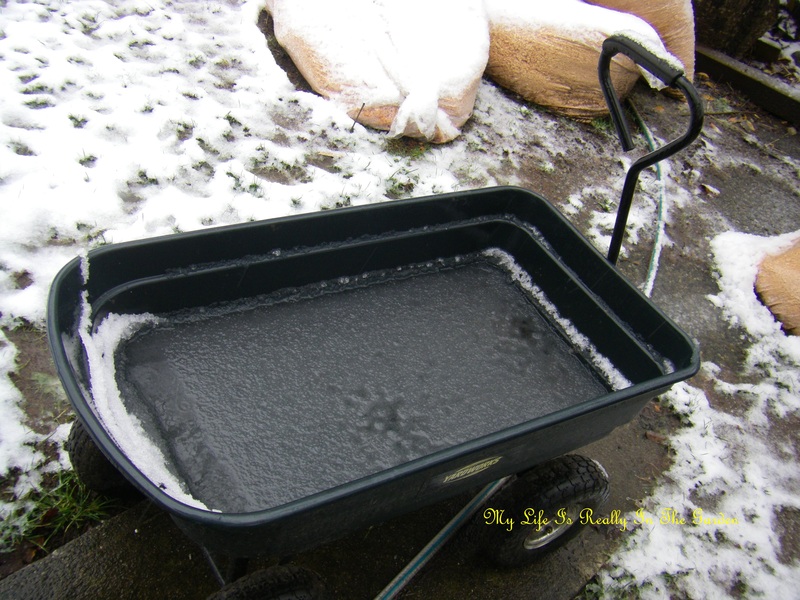 Monday .. more snow and some rain .. here is my wonderful garden cart … I really should have put it away from the elements .. but it is a tough little cart. 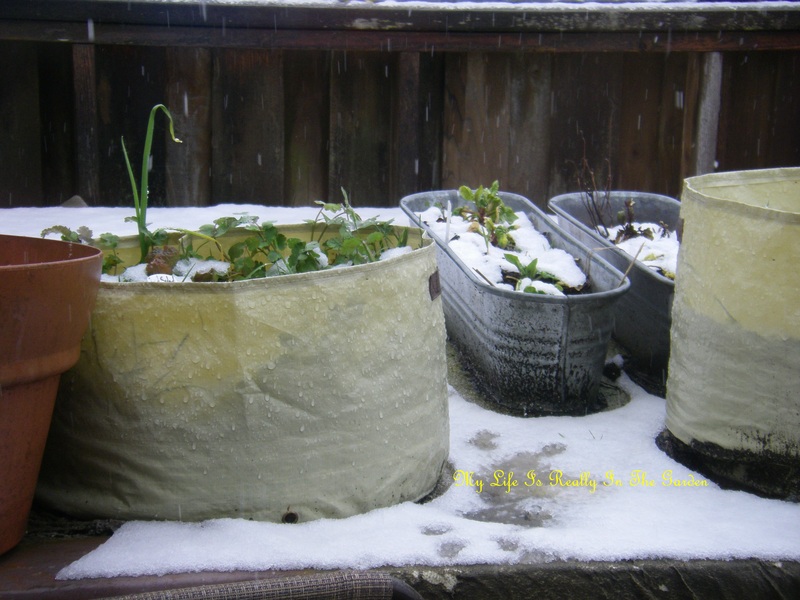 My little crop of lettuce, spinach and Mizuna and other greens were doing well, during the snow/thaw/snow/thaw routine. And a few days ago I removed all of these containers from the old hot tub cover and took down below to my potting area. There was lots of cilantro .. I potted some of that up .. will show later. 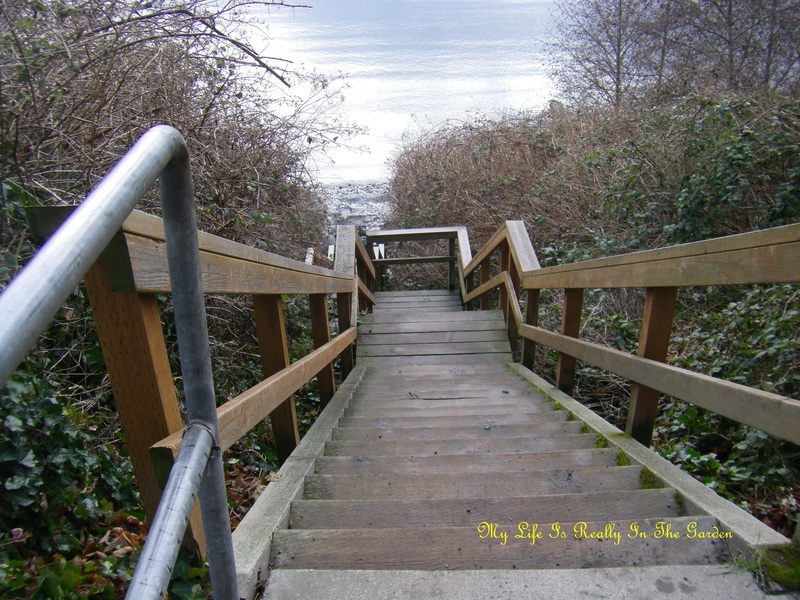 This is the view from the bottom (at the beach part) .. lots of stairs..
Last Wednesday, as we walked briskly along .. 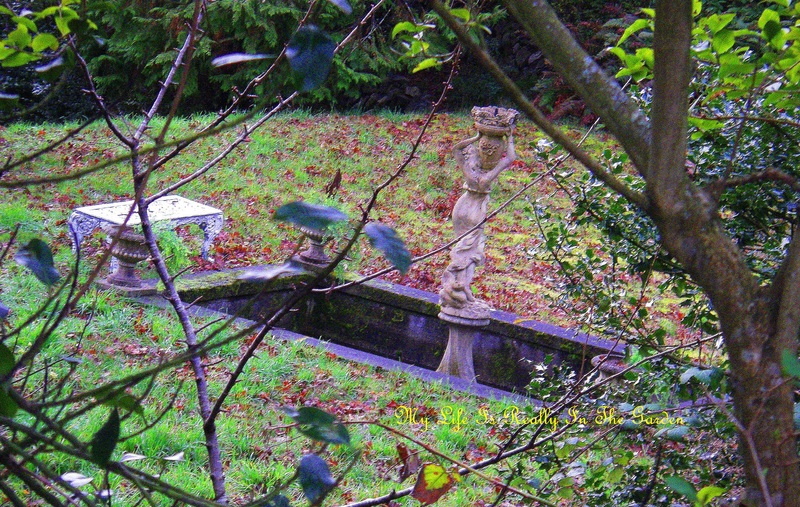 I happened to notice this beautiful formal pond and statuary down below .. can you imagine having such a garden? So peaceful. 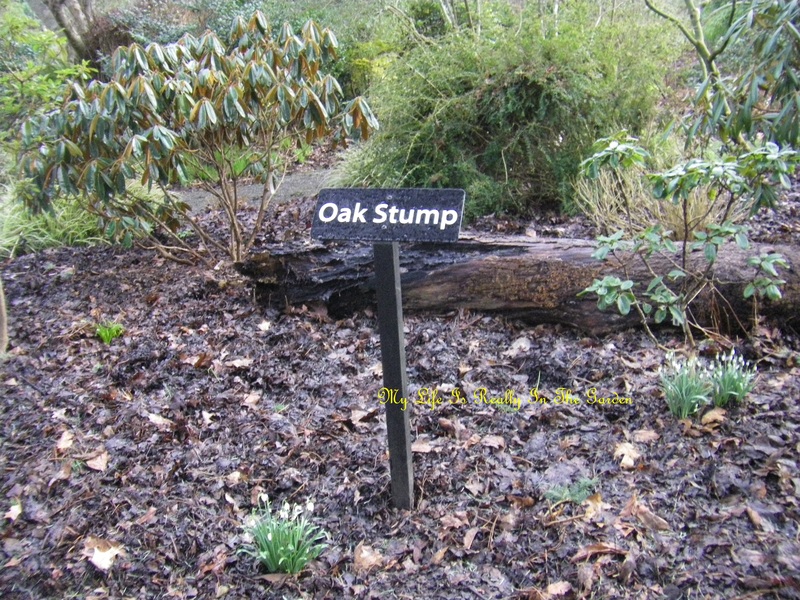 Ok, this was a bit funny to me .. this is obviously an oak stump .. talk about excess signage .. still, rather sweet.. 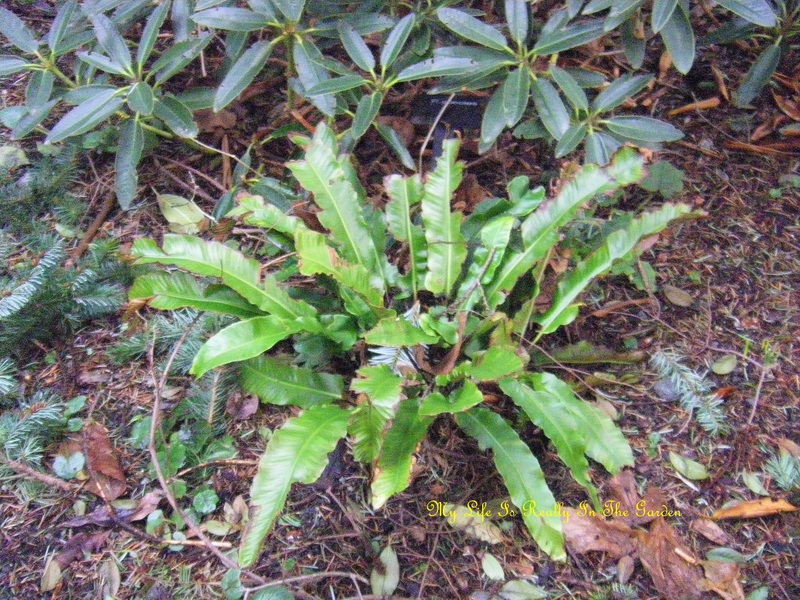 I believe this is a deer tongue fern ..
And in the city of Rhodo’s .. here is yet another …There is another park, Playfair, in Victoria, which has a forest of rhodo’s .. the park is also a doggy park and I spent many many hours there with my lovely dogs. 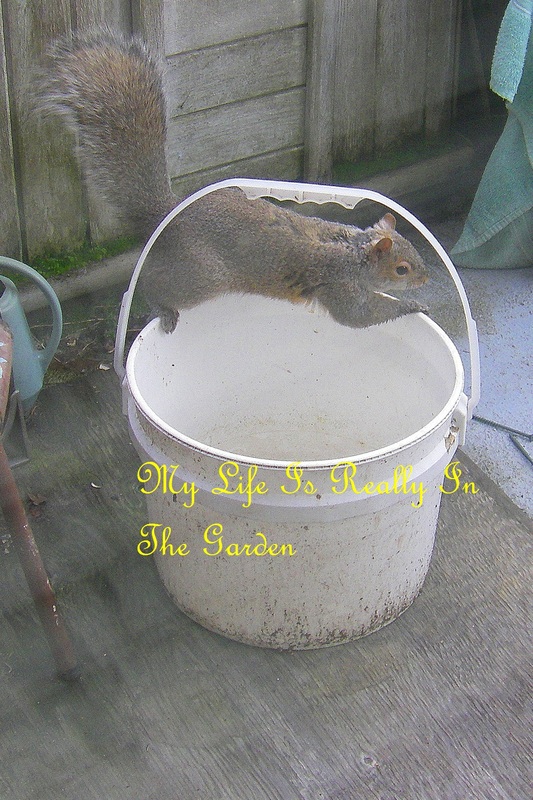 Our neighbourhood squirrel was trying to get a drink of water out of this bucket .. however, I had emptied it .. so she was a little surprised. 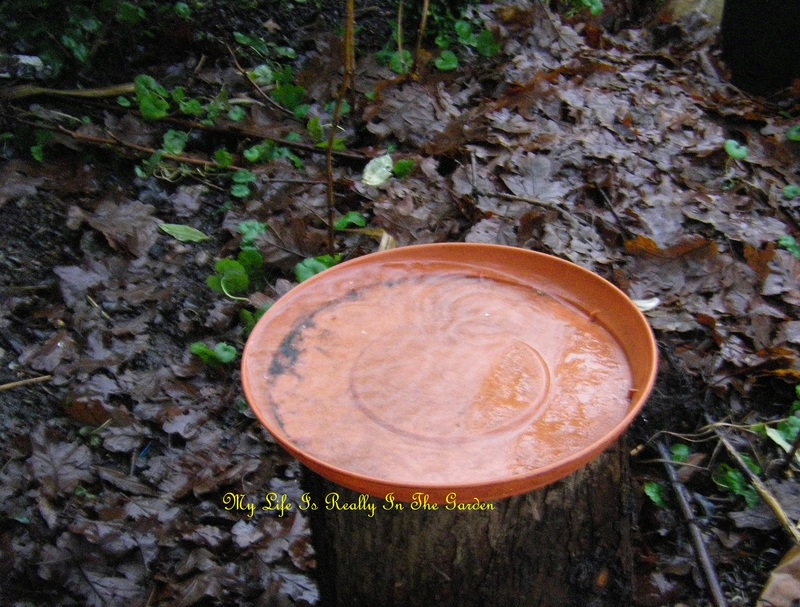 There are lots of water sources in the yard for the birds and squirrels. 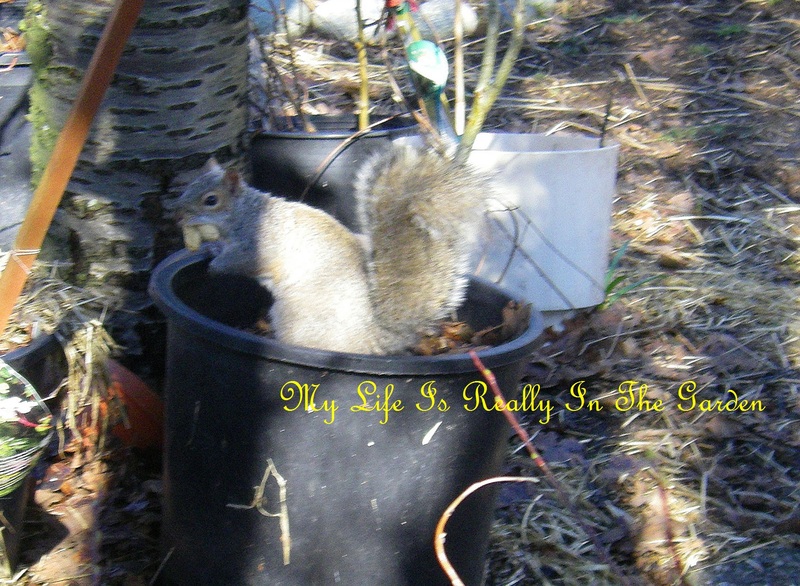 Here she is, attempting to hide her cache of peanuts .. oops .. she sees me ..
Lovely …. 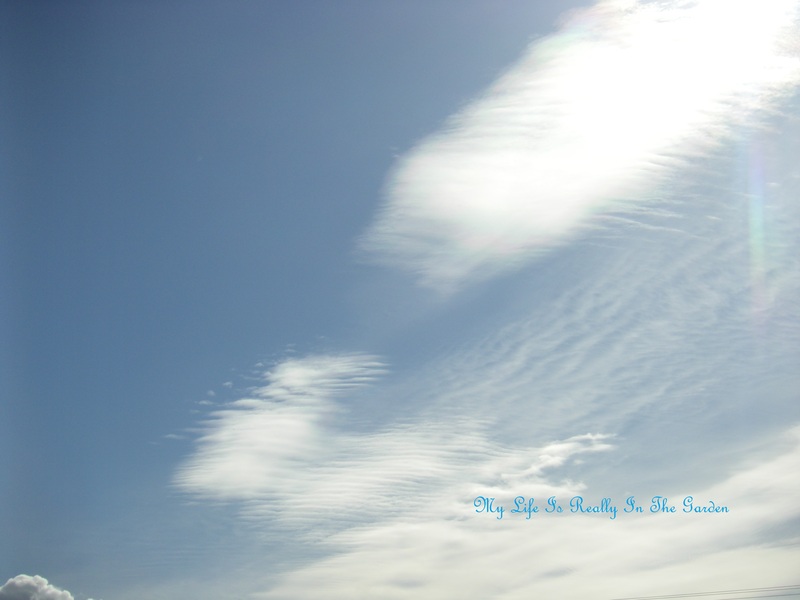 sky art .. So, some snow, some rain, some sun, some rain. 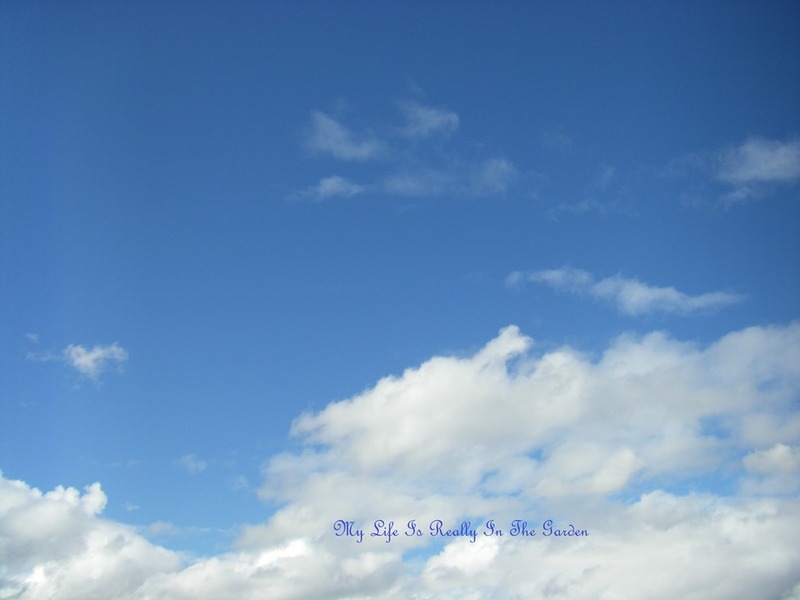 Typical Victoria weather .. aren’t we lucky! And today I went to get some lovely Llama manure .. more about that tomorrow. 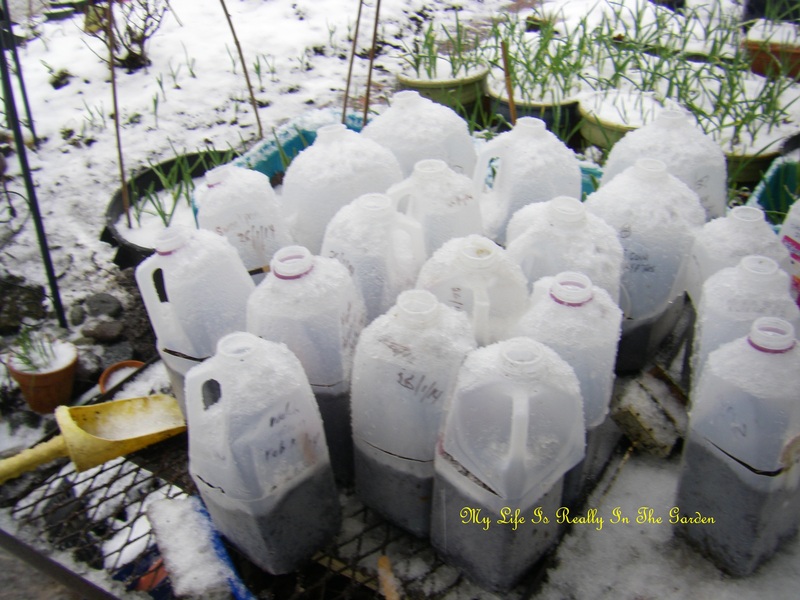 Today also I attacked my triple compost bins .. emptying, sifting, mixing, spring is definitely on its way! 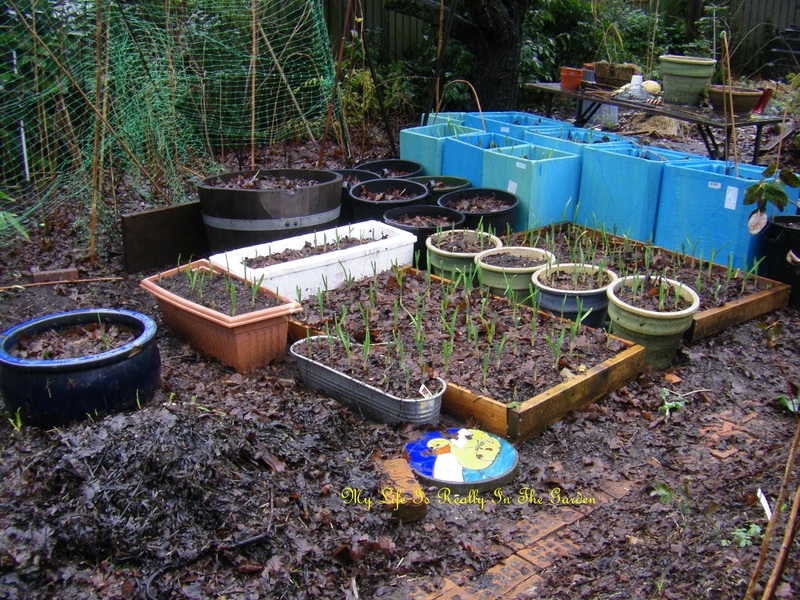 Categories: Gardening | Tags: blue skies, Gardens, Garlic, llama manure, rain, snow, squirrels, sun | Permalink. Now this plant is one of two that I purchased maybe 15 years or so ago. They are much tougher than the plants of the same type that I purchased a few years ago. My original two stayed in the original pot for maybe 5 years at least .. placed in an area to be planted, but forgotten about. No attention to these two and they thrived! I could not believe my luck one hot summer’s day .. when I was clipping some plants nearby and found these two. Sad little specimens, growing despite my neglect. Bravely stretching their roots where they were. So I carefully removed them. Planted them by the fence and they are thriving. One of these is actually flowering (it gets more sun) and the one in the shady back hasn’t flowered. I’ve read that it isn’t easily propagated from cuttings, but that hasn’t stopped me from trying. I’ll see next spring if my confidence is justified. Yesterday, the rains kept a’comin! With brief spells of almost sunshine. I went outside to replenish the bird feeders. Here is a plant saucer that I keep filled with water for the lovely birds to bathe and have a little drink. Can you see the rain drops? You know .. I read somewhere .. that .. if you have sun chokes in the garden .. you will always have them. I kinda scoffed at this. Now I believe! Last fall I had dug up a great supply of these. 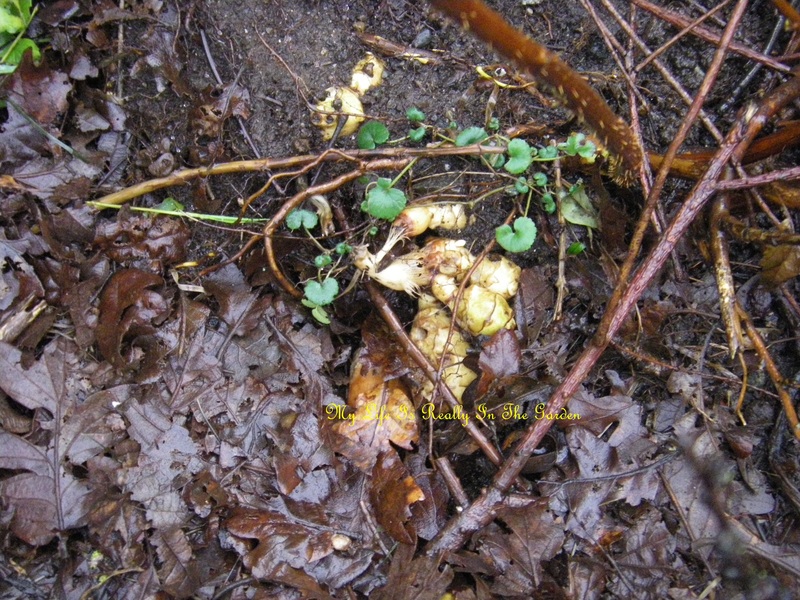 And gave them away to those who love this bulbous root of a plant that looks so much like the sunflowers. 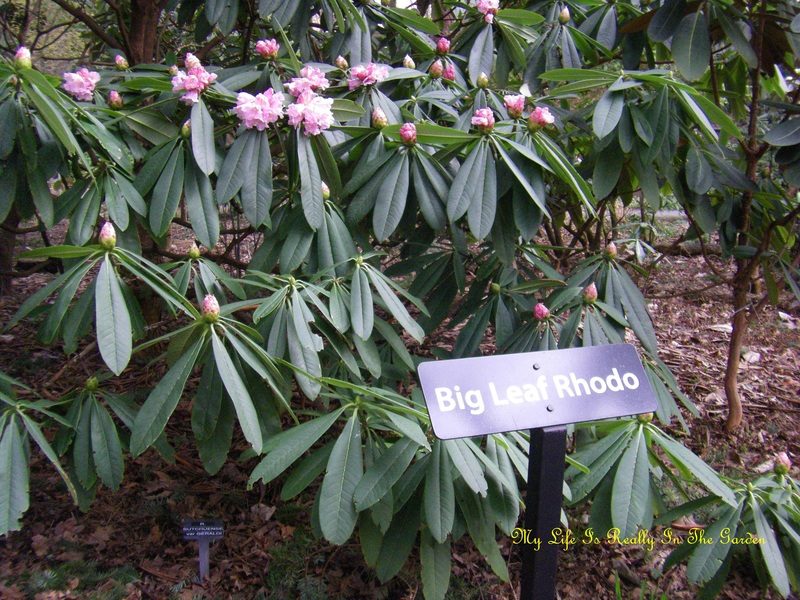 All of my plants were gigantic. (I’d originally thought that some of the sunflowers had developed club-root until I discovered what they really were). And all mine were not planted by me! They were volunteers from the birds, I think. 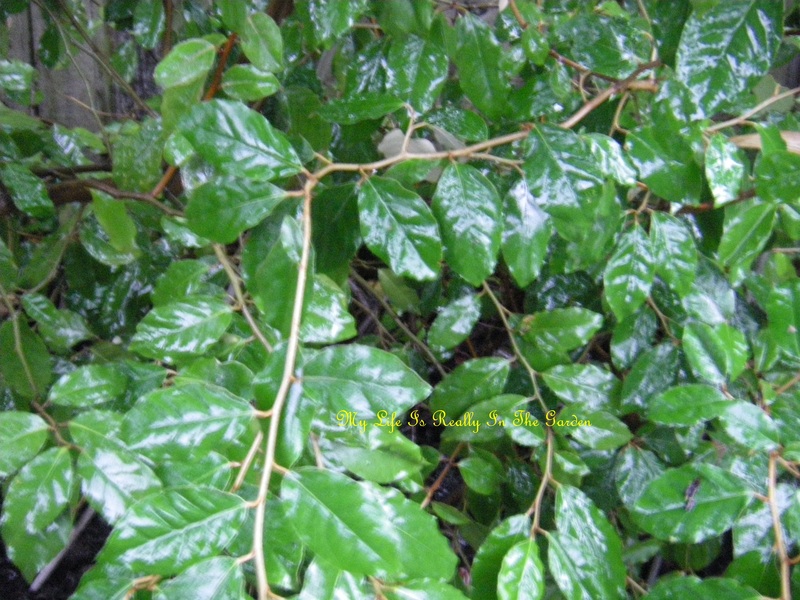 While I was outside yesterday, in the chill of the backyard, umbrella in hand during the bursts of rain .. 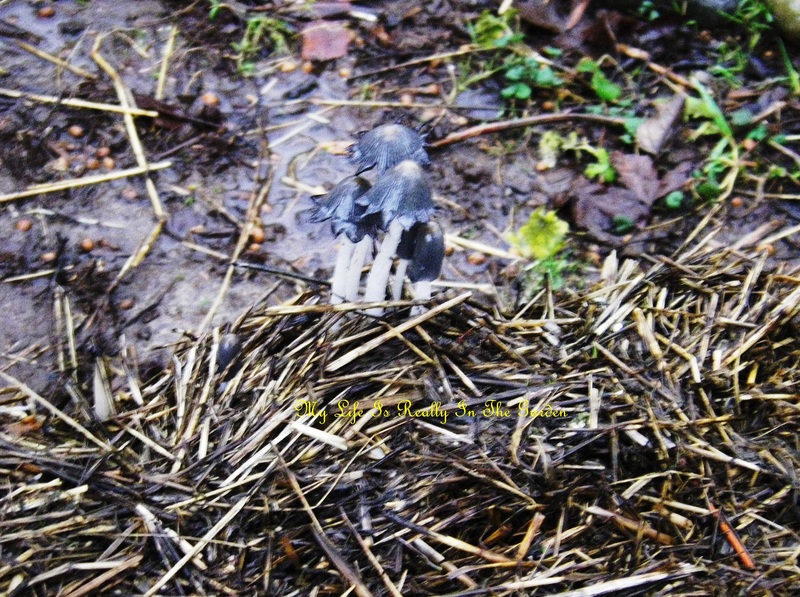 I discovered these mushroom-type plants growing merrily from the bale of hay .. kind of pretty, I think. And then .. I just had to step back and look at my impromptu garlic beds. This is the result of learning that garlic cannot be grown in the same area for more than 2 years (rust and all that) and because this is the sunniest area of the yard, I needed to be creative in planting them. Thus all the containers! And I was being so firm with myself, just planting enough garlic. 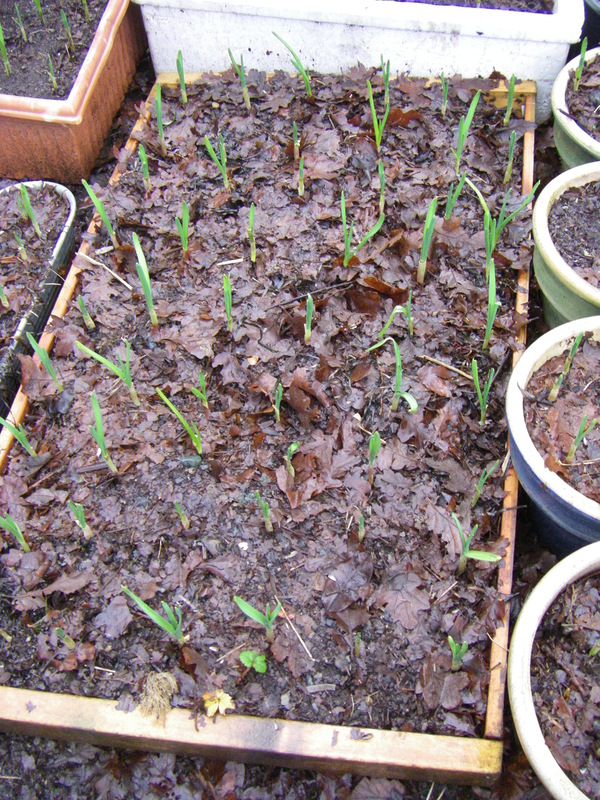 Except, every time I found a sprouting garlic in my cooking stash, I just had to plant it (them). 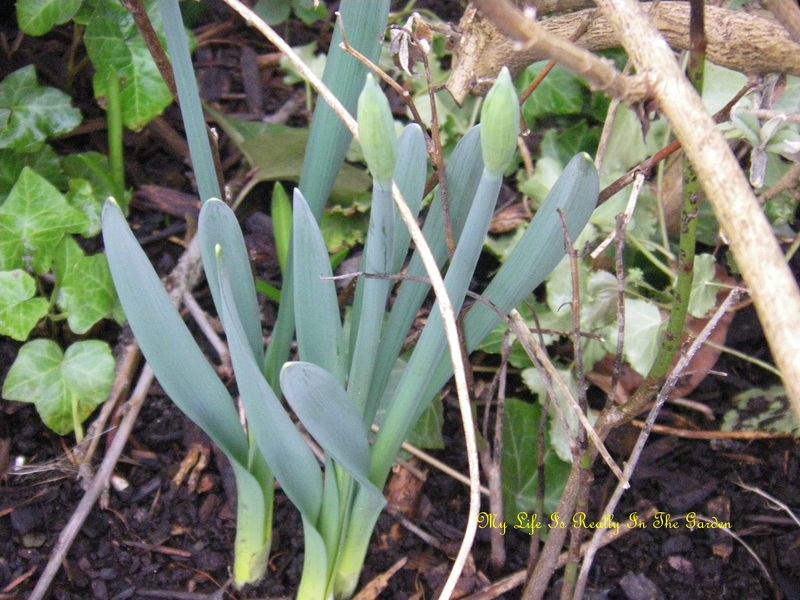 Plus, I have my Irish garlic and some from a friend (both labelled) I just, you know, had to plant them. Thus, I have a lot of garlic. Just so you know .. all my garlic (except for these two types) are all grown by me. Organic and all that. Fed well with seaweed and EM. Yegads and gadzooks! 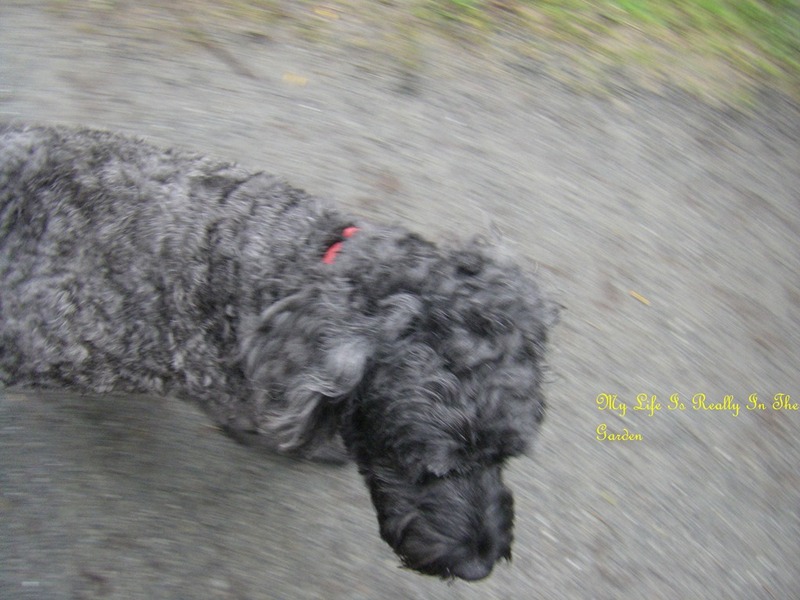 I’d nearly forgotten why I was blogging today! It was to share some special recent purchases. After looking at my knees when I was wearing shorts, I was shocked. I had “gardeners’ knees! (we all know what that is like!) 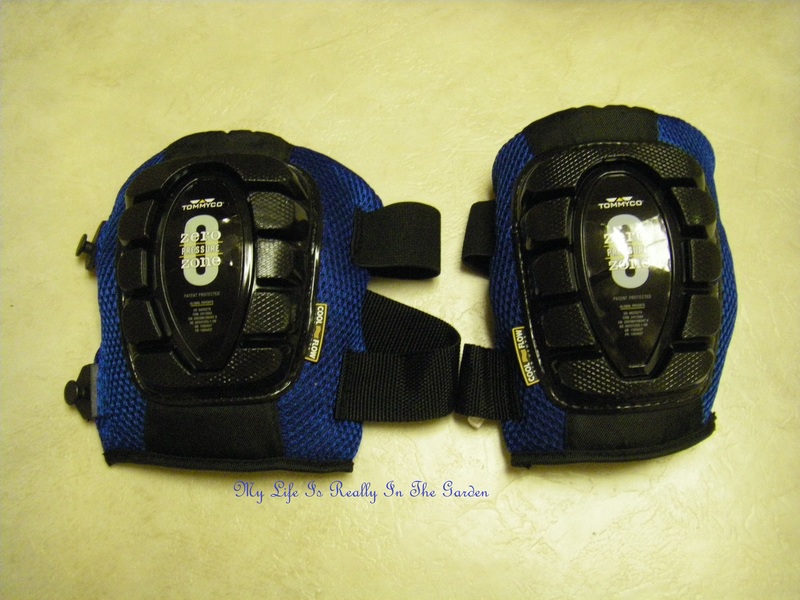 So … previously I’d given up on knee pads .. had bought a few pairs and they all slid down. They were fine at first, but the more I moved around the yard, the more they slipped down and the more I had to adjust them. Enough of that! 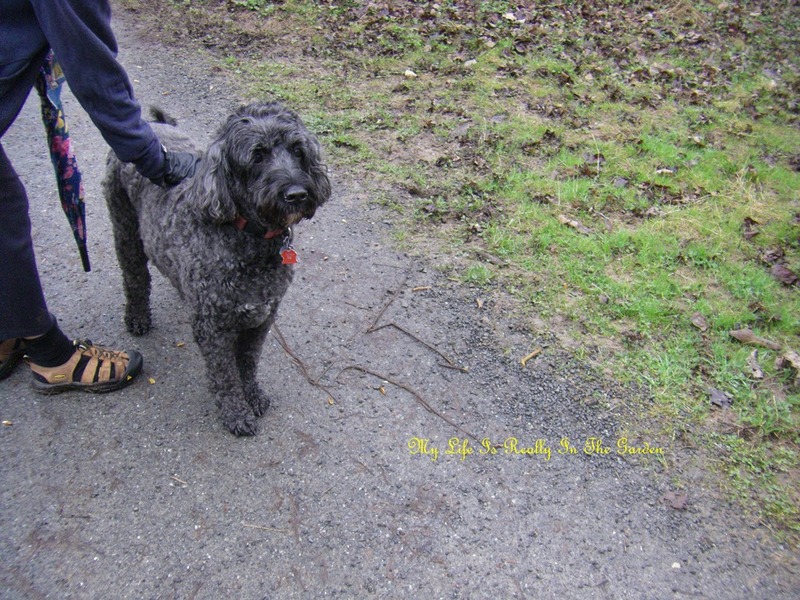 But, during a recent visit to our lovely Lee Valley store in Colwood .. I decided to look at what they had. And I decided on this pair. They seem to work quite well .. they fasten easily and don’t seem to slide. I’ll test them out well this spring. Gardeners just have to get down on the ground and look closely at plants and I am tired of moving a kneeling mat around the yard. So here goes. 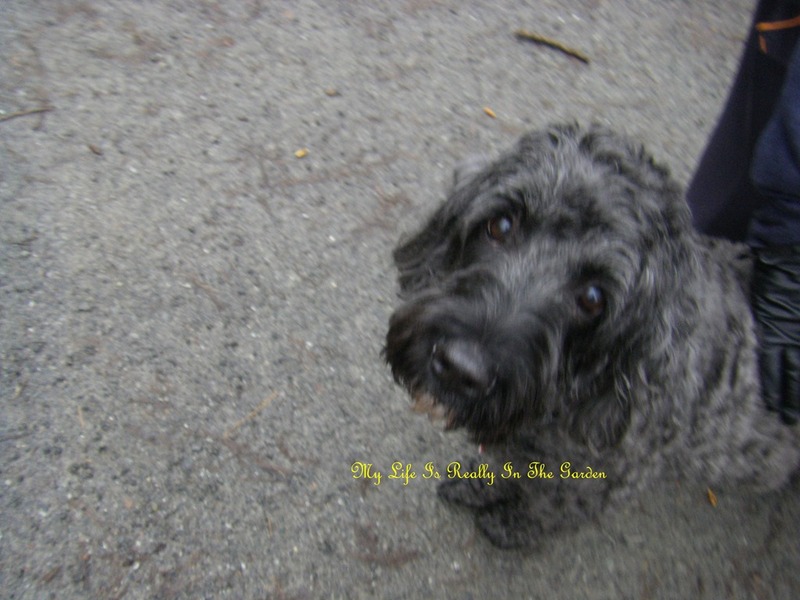 And if my knees are lovely and beautiful .. well, so much the better, eh????? However, aside from the above knee pads .. look at this most beautiful basket that I purchased from a thrift store. I know .. I was going to curtail unnecessary purchases this year. But, since I was at Lee Valley .. the thrift store was .. oh, so close .. and I decided to go there. And I am so very glad that I did! 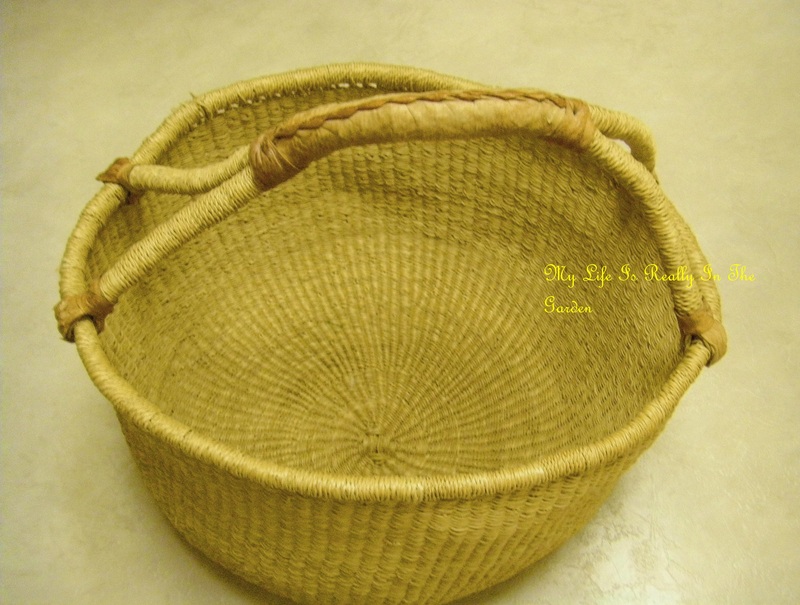 For only $4 … I have the most lovely basket. Already it is quite handy .. I’ve found myself loading it up with things from “upstairs” that need to go “downstairs” .. and I just know that I will be filling it often with my garden produce next summer. Oh, what fun this is! I just love baskets and this one is number one my favourite. Well .. that is it for now. Happy with my recent purchases. And looking forward to sunny days. But in the meantime .. laziness calls me .. 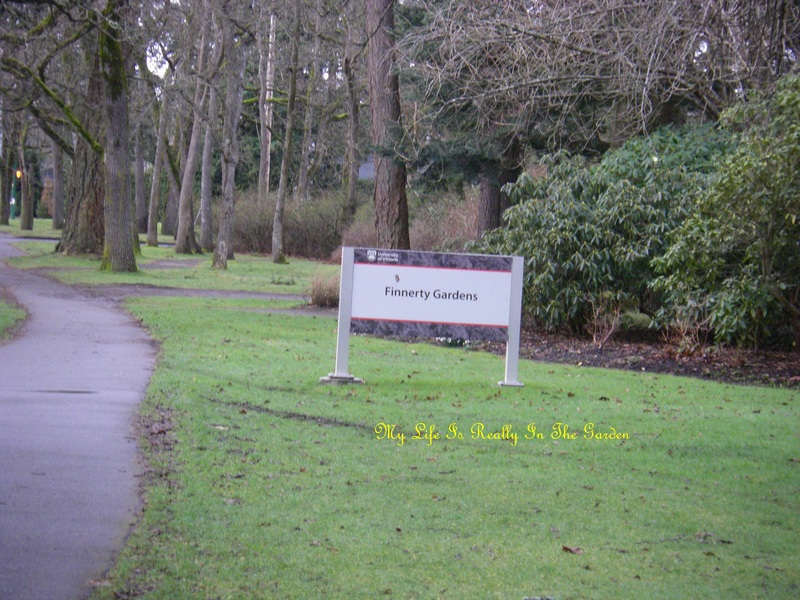 Categories: Gardening | Tags: ; silverberry, baskets, garlic beds, knee pad, rain | Permalink.